Mark and Cora Lijek, a young couple serving in their first foreign service post, knew the slogans — “God is great! Death to America!” — and had learned to ignore the din as they went about their duties. But today, the protest sounded louder than usual. And when some of the local employees came in and said there was “a problem at the gate,” they knew this morning would be different. Militant students were soon scaling the walls of the embassy complex. Someone forced open the front gate, and the trickle of invaders became a flood. 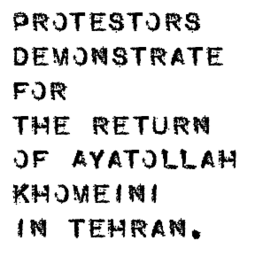 The mob quickly fanned across the 27-acre compound, waving posters of the Ayatollah Khomeini. They took the ambassador’s residence, then set upon the chancery, the citadel of the embassy where most of the staff was stationed. It was pouring rain when they opened the heavy roll-down steel doors. The street was mercifully empty. One group turned north, only to be captured moments later and marched back to the embassy at gunpoint. Heading west, the Staffords, the Lijeks, Anders, and several Iranians avoided detection. They had almost reached the British embassy when they encountered yet another demonstration. A local in their group gave some quick advice — “Don’t go that way” — and then she melted into the crowd. 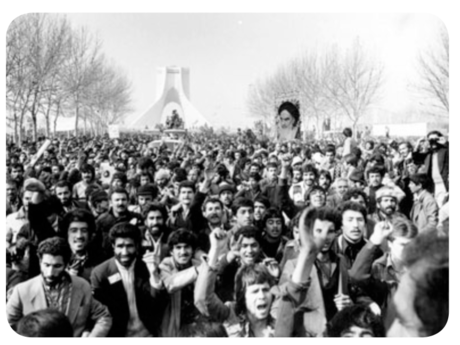 The group zigzagged to Anders’ nearby apartment, at one point sneaking single-file past an office used by the komiteh, one of the gun-wielding, self-appointed bands of revolutionaries that controlled much of Tehran. 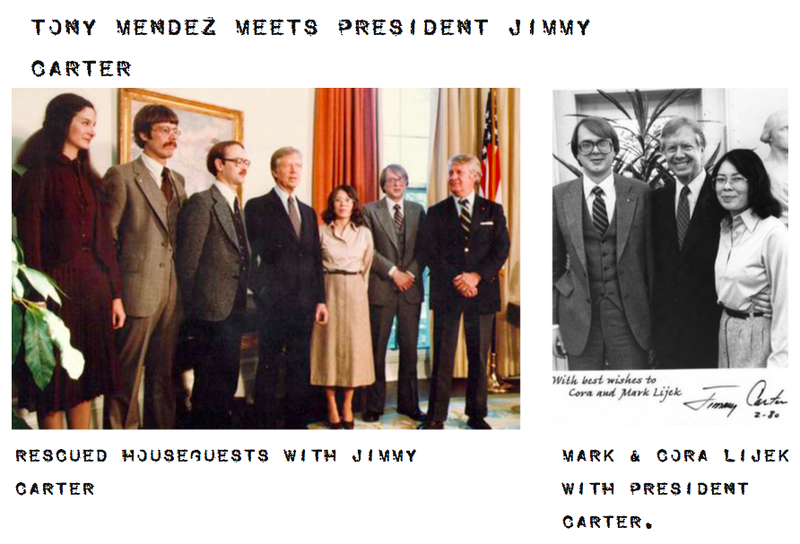 The Iran hostage crisis, which would go on for 444 days, shaking America’s confidence and sinking President Jimmy Carter’s reelection campaign, had begun. Americans would soon be haunted by Khomeini’s grim visage, and well-armed Islamic militants would parade blindfolded hostages across the nightly news and threaten trials for the “spies” that they’d captured. Everyone remembers the 52 Americans trapped at the embassy and the failed rescue attempt a few months later that ended with a disastrous Army helicopter crash in the Iranian desert. But not many know the long- classified details of the CIA’s involvement in the escape of the other group — thrust into a hostile city in the throes of revolution. By 3 o’clock that afternoon, the five people huddled in Anders’ one-bedroom apartment realized they were in serious trouble. As the militants seized control, there were fewer English speakers on the radio net. Codename Palm Tree had fled. After the last holdouts in the chancery’s vault radioed their surrender, the only voices coming through the box were speaking in Farsi. The embassy was lost. The escapees were on their own. Mendez, 38, had been at the agency during the Vietnam War.  But this seemed worse. At least then the US had another government to talk to. 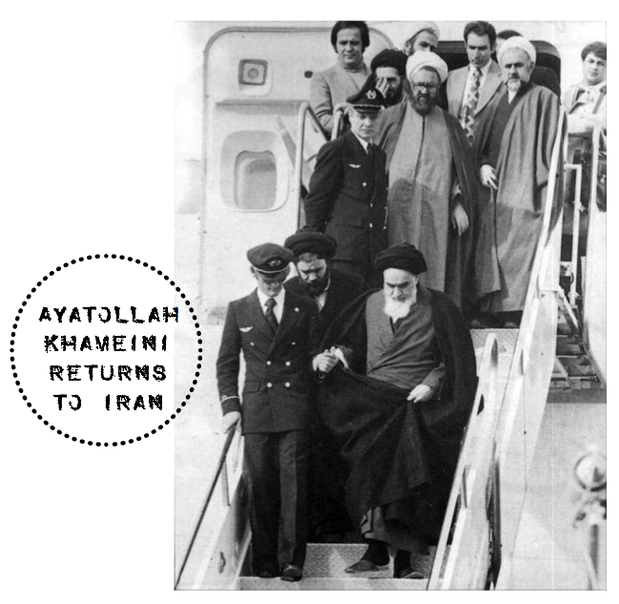 In Iran, the Ayatollah Khomeini and the Revolutionary Council refused to negotiate. With no diplomatic channels open, clandestine efforts were the last hope. But since the revolution had begun a year earlier, most of the CIA’s intelligence infrastructure in Iran had been destroyed. As former head of the Disguise Section and current authentication chief of the CIA’s Graphics and Authentication Division, Mendez oversaw logistical operations behind the tens of thousands of false identities the CIA was running. 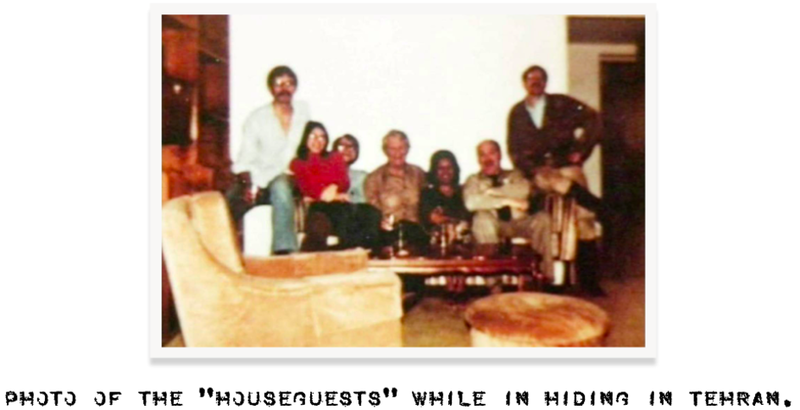 He knew there were only three field agents in Iran and that they had all been captured at the embassy. At first, Mendez thought his job was to free the hostages. He started suiting up agents to penetrate Iran, and he spent a whirlwind 90 hours straight working on a plan called Operation Bodyguard in which a dead body double for the Shah would be used to arrange for the hostages’ release. It was a gorgeous plan, he thought. But the White House rejected it. Then, a few weeks after the takeover of the embassy, Mendez received a memorandum from the State Department marked as secret. The news was startling: Not everyone in the embassy had been captured. A few had escaped and were hiding somewhere in Tehran. Only a handful of government officials knew the details because Carter’s advisers and the State Department didn’t want to tip off the Iranians. Mendez had spent 14 years in the CIA’s Office of Technical Service — the part of the spy shop known for trying to plant explosives in Fidel’s cigars and wiring cats with microphones for eavesdropping. His specialty was using “identity transformation” to get people out of sticky situations. He’d once transformed a black CIA officer and an Asian diplomat into Caucasian businessmen — using masks that made them ringers for Victor Mature and Rex Harrison — so they could arrange a meeting in the capital of Laos, a country under strict martial law. When a Russian engineer needed to deliver film canisters with extraordinarily sensitive details about the new super-MiG jet, Mendez helped his CIA handlers throw off their KGB tails by outfitting them with a “jack-in-the-box.” An officer would wait for a moment of confusion to sneak out of a car. As soon as he did, a spring-loaded mannequin would pop up to give the impression that he was still sitting in the passenger seat. Mendez had helped hundreds of friendly assets escape danger undetected. 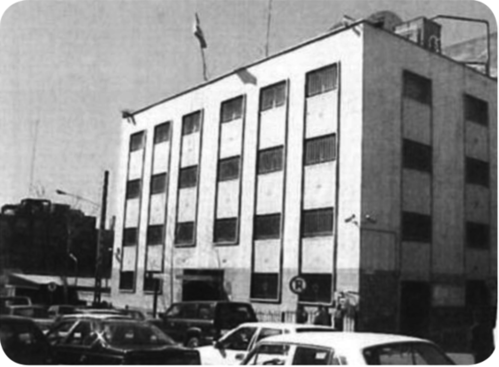 the canadian embassy in tehran. To minimize the risk, the group was split between the Sheardowns’ house and the official residence of the Canadian ambassador, Ken Taylor. 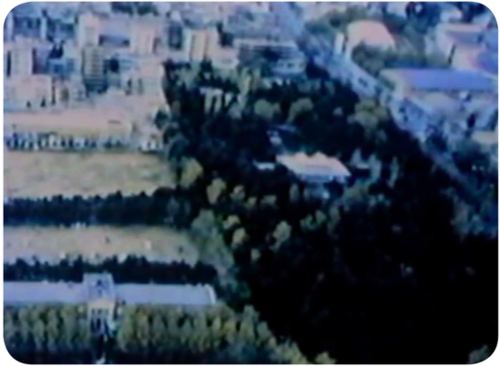 Both homes were in the fashionable Shemiran district in northern Tehran. The Qajar dynasty buried its kings here, in the foothills of the Elburz Mountains, and the district was now home to merchants, diplomats, wealthy civil servants — and a half-dozen diplomatic refugees in hiding: the five from the consulate and Henry Lee Schatz, the Codename Palm Tree broadcaster. He had hidden in a Swedish diplomatic residence for weeks before making his way to the Sheardowns. in the shemiran district of tehran. The accommodations were luxurious. There were books, English-language newspapers, and plenty of beer, wine, and scotch. But the guests could never leave their quarters. As the weeks went by, a quiet routine developed. They cooked elaborate dinners, read, played cards. Their biggest daily concern was how to assemble teams for bridge — and whether they’d be captured and potentially executed. As time passed, the threat of discovery was mounting. The militants had been combing embassy records and figuring out who was CIA. They had even hired teams of carpet weavers to successfully reassemble shredded documents. 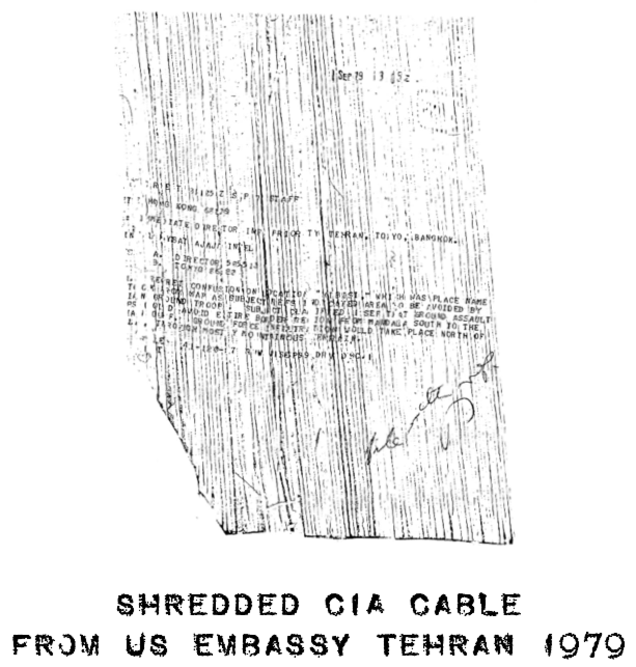 (The recovered papers would later be published by the Iranian government in a series of books called Documents From the US Espionage Den.) They might eventually figure out the true number of embassy staff, count heads, and come up short. Outside, the Revolutionary Guards had recently been making a show of force in Shemiran, menacing the streets where foreigners lived and coming very close to both hideouts. Once, the Americans had to dive away from the windows when a military helicopter buzzed the Sheardowns’ house. And everyone was spooked when an anonymous caller to the Taylor residence asked to speak with Joe and Kathy Stafford and then hung up. 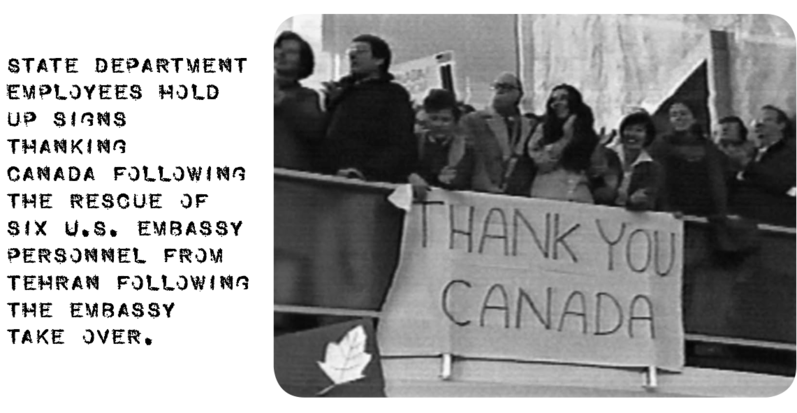 Back home, the US and Canadian governments were nervous, too. Hints about the escapees had leaked, and several journalists were on the verge of piecing together the story. Even as the CIA worked to free the six, a wild array of unofficial rescue plans surfaced, mostly involving overland routes and smugglers. The CIA held discussions with Ross Perot, who’d just snuck two of his Electronic Data Systems employees out of a jail in Tehran. At a NATO meeting in December, an antsy Flora MacDonald, Canada’s minister of external affairs, confronted US secretary of state Cyrus Vance and suggested having the six Americans make for the Turkish border — on bicycles if necessary. He was stuck. For about a week, no one in Washington or Ottawa could invent a reason for anyone to be in Tehran. Then Mendez hit upon an unusual but strangely credible plan: He’d become Kevin Costa Harkins, an Irish film producer leading his preproduction crew through Iran to do some location scouting for a big-budget Hollywood epic. Mendez had contacts in Hollywood from past collaborations. (After all, they were in the same business of creating false realities.) 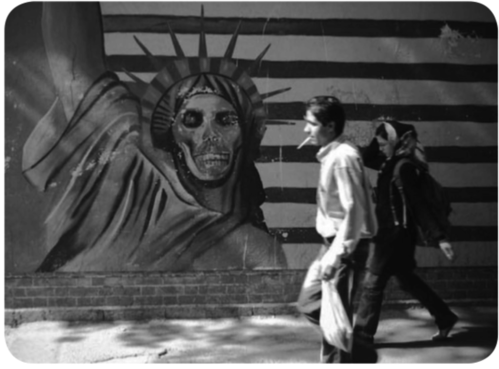 And it wouldn’t be surprising, Mendez thought, that a handful of eccentrics from Tinseltown might be oblivious to the political situation in revolutionary Iran. The Iranian government, incredibly, was trying to encourage international business in the country. They needed the hard currency, and a film production could mean millions of US dollars. Mendez gave his superiors an operations plan, with an analysis of the target, mission, and logistics. The task was so difficult Mendez' bosses signaled that they’d be reluctant to sign off on anything but an airtight exfiltration mission. But this proposal was detailed enough to be approved by them and the White House. Plausibility, as they say in the espionage business, was good. John chambers on the planet of the apes set. To build his cover, Mendez put $10,000 into his briefcase and flew to Los Angeles. 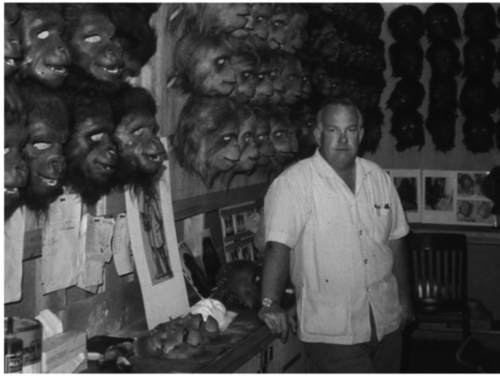 He called his friend John Chambers, the veteran makeup artist who had won a 1969 Academy Award for Planet of the Apesand also happened to be one of Mendez’s longtime CIA collaborators. Chambers brought in a special effects colleague, Bob Sidell. They all met in mid-January and Mendez briefed the pair on the situation and his scheme. Chambers and Sidell thought about the hostages they were seeing each night on television and quickly declared they were in. Mendez knew they had to plan the ruse down to the last detail. “If anyone checks,” he said, “we need that foundation to be there.” If they were exposed, it could embarrass the government, compromise the agency, and imperil their lives and the lives of the hostages in the embassy. The militants had said from the beginning that any attempted rescue would lead to executions. In just four days, Mendez, Chambers, and Sidell created a fake Hollywood production company. They designed business cards and concocted identities for the six members of the location-scouting party, including all their former credits. 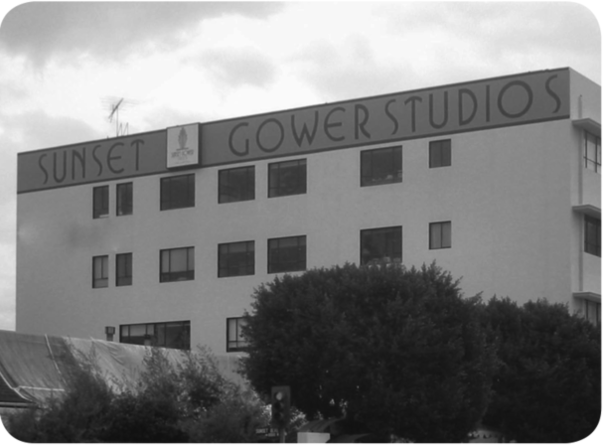 The production company’s offices would be set up in a suite at Sunset Gower Studios on what was formerly the Columbia lot, in a space vacated by Michael Douglas after he finished The China Syndrome. All they needed now was a film — and Chambers had the perfect script. Months before, he had received a call from a would-be producer named Barry Geller. 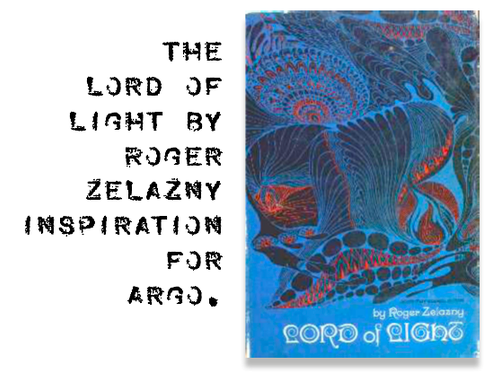 Geller had purchased the rights to Roger Zelazny’s science fiction novel, Lord of Light, written his own treatment, raised a few million dollars in starting capital from wealthy investors, and hired Jack Kirby, the famous comic book artist who cocreated X-Men, to do concept drawings. Along the way, Geller imagined a Colorado theme park based on Kirby’s set designs that would be called Science Fiction Land; it would include a 300-foot-tall Ferris wheel, voice-operated mag-lev cars, a “planetary control room” staffed by robots, and a heated dome almost twice as tall as the Empire State Building. Geller had announced his grand plan in November at a press conference attended by Jack Kirby, former football star and prospective cast member Rosey Grier, and several people dressed like visitors from the future. Shortly thereafter, Geller’s second-in-command was arrested for embezzling production funds, and the Lord of Light film project evaporated. Since Chambers had been hired by Geller to do makeup for the film, he still had the script and drawings at his house. The story, a tale of Hindu-inspired mystical science fiction, took place on a colonized planet. Iran’s landscape could provide many of the rugged settings required by the script. A famous underground bazaar in Tehran even matched one of the necessary locations. “This is perfect,” Mendez said. 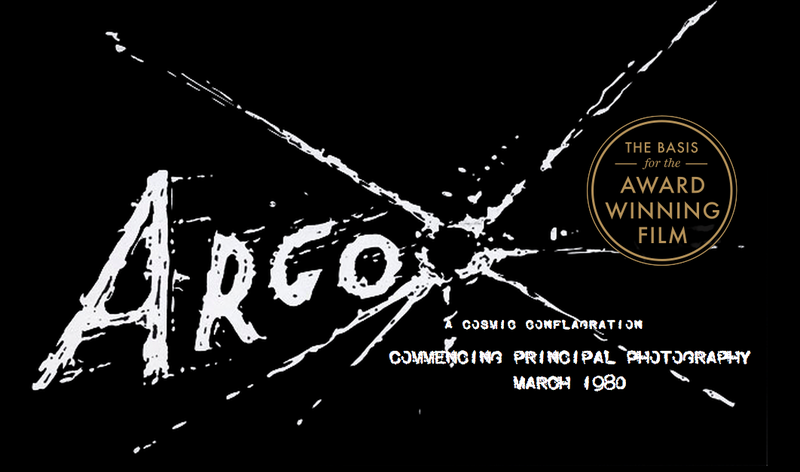 He removed the cover and gave the script a new name, Argo — like the vessel used by Jason on his daring voyage across the world to retrieve the Golden Fleece. 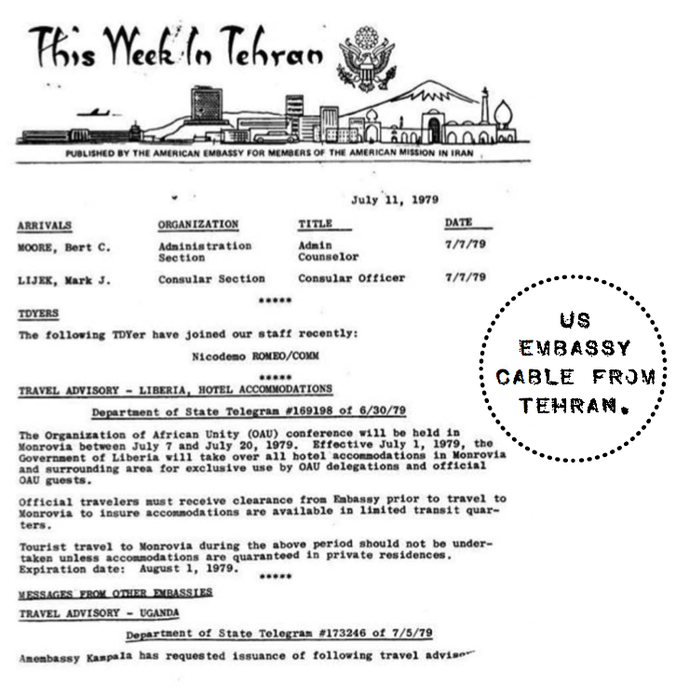 on January 25, 1980, after receiving a cable from the CIA director indicating President Carter’s personal approval that read, “You may proceed. Good luck.” He flew in from Europe, where he’d obtained a visa at the Iranian consulate in Bonn. “I have a business meeting with my company associates,” he explained to Iranian authorities in Germany. “They’re flying in from Hong Kong tomorrow and are expecting me.” Mendez had broken into a cold sweat in the airport — even professionals have their moments of doubt — but he knew there was no turning back. He put his faith in the strength of his cover story. As a specialist in forgery and counterfeiting, Mendez arrived with his watercolor kit and tools. But the rest of the exfiltration supplies had been sent ahead through diplomatic pouch and awaited him at the Canadian embassy. Mendez included everything he could think of: health cards and driver’s licenses, maple leaf pins, receipts from restaurants in Toronto and Montreal, the Studio Six business cards, a lens for the cinematographer, and the Argo production materials. 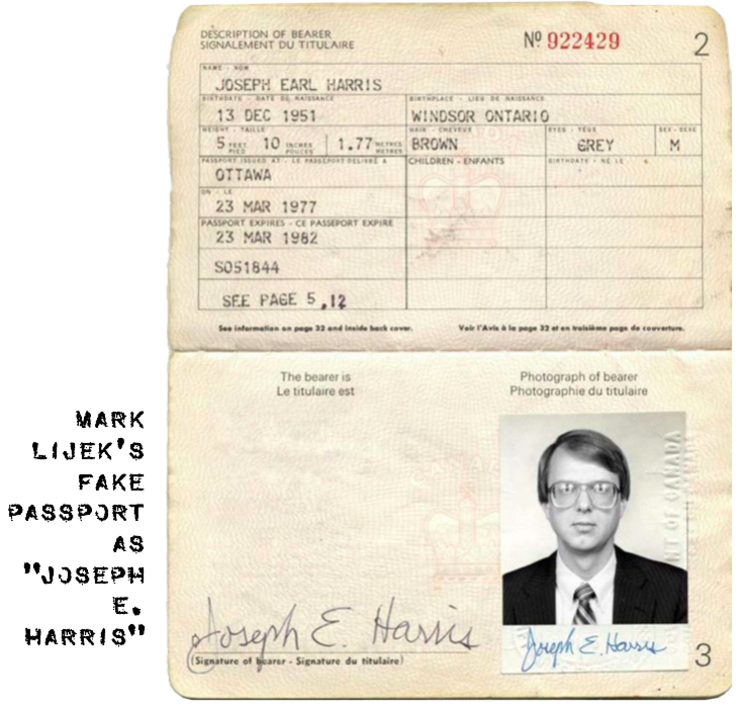 The six passports were what Mendez called “real fakes”: genuine documents that the Canadian government prepared for the Holly wood aliases devised by the CIA. 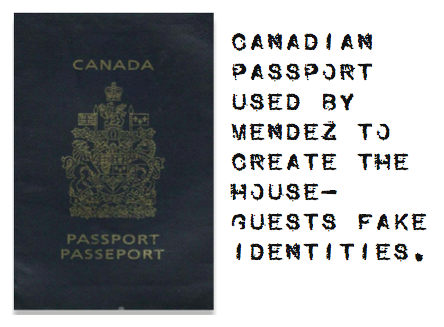 Acquiring those passports had been a coup for Mendez; Canadian law prohibits such falsification, but the country’s parliament held an emergency secret session, the first since World War II, to make an exception. 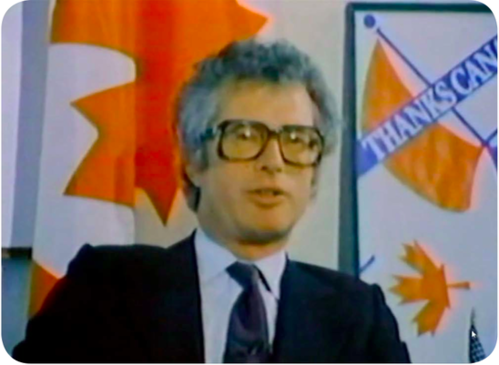 Mendez rendez voused with ambassador Ken Taylor in his office, retrieved the Canadian passports, and imprinted them with Iranian visas. His ink pad was dry from the trip, so he wet it with some of the ambassador’s scotch and carefully entered dates indicating that the six members of the film crew had arrived in Iran the day before. That night the Staffords, Lijeks, Schatz, and Anders dined with the ambassadors of Denmark and New Zealand, and some staff, at the Sheardown residence. The Americans had lit a fire, set out the hors d’oeuvres, and were drinking when Taylor arrived with a surprise guest. “We have prepared for your escape,” Mendez announced during dinner. He then explained the cover story and presented Kirby’s drawings, the script, the ad in Variety, and the telephone number of the Studio Six office back on Sunset Boulevard. Mendez handed out the business cards and passports. Cora Lijek would become Teresa Harris, the writer. Mark was the transportation coordinator. Kathy Stafford was the set designer. Joe Stafford was an associate producer. Anders was the director. Schatz, the party’s cameraman, received the scoping lens and detailed specs on how to operate a Panaflex camera. Mark Lijek noticed that Mendez wore a distinctively British Harris tweed sport coat, in keeping with his alias as an Irish film producer. “What about the airport controls?” Joe Stafford asked. It was a good question. Mendez knew there were no foolproof operations, and this one could hit a significant snag. Iranian immigration used a dual-copy embarkation/disembarkation form. There were matching yellow and white sheets. 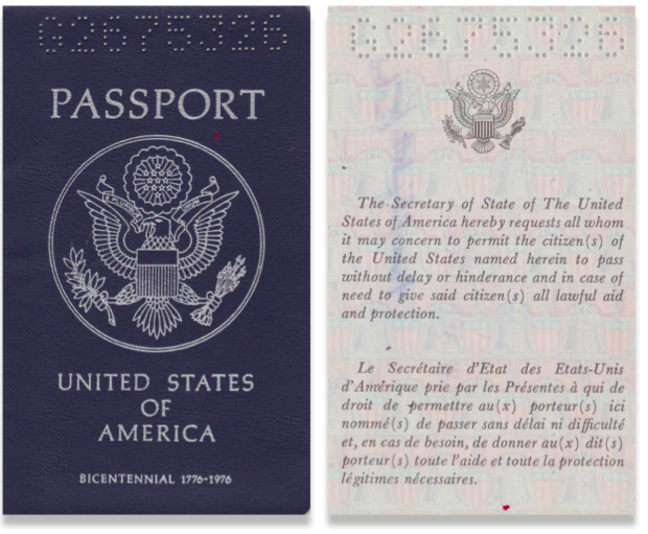 Upon entry, immigration kept the white copy, which was supposed to be compared with the yellow copy when someone left. A CIA contact at the Mehrabad Airport had provided the forms, and it had been no problem for Mendez to forge the yellow copy. Recent intelligence suggested that immigration agents often didn’t bother to match the forms. The Americans were initially nervous about the plan. “Let me just show you how this kind of operation works,” Mendez said, picking up two corks from the many opened wine bottles. He put the corks between his thumbs and forefingers in two interlocking D shapes. “Here’s the bad guys,” he said, showing that they couldn’t be separated, “and here’s us.” With a sudden sleight of hand, he pulled them apart. Studio Six was busy back home as well. Bob Sidell and his wife, Andi, were manning the production office. They had three phone lines. One was an unpublished number known only to the CIA. If it ever rang, it meant that Mendez and the rest of the Argo crew were either in deep trouble or home free. Andi answered the other two lines, which were ringing constantly. When the ads appeared, Hollywood Reporter and Variety writers called, generating small news articles in each magazine. “Two noted Hollywood makeup artists — one an Oscar winner — have turned producers,” read an article in the January 25, 1980, Holly wood Reporter. 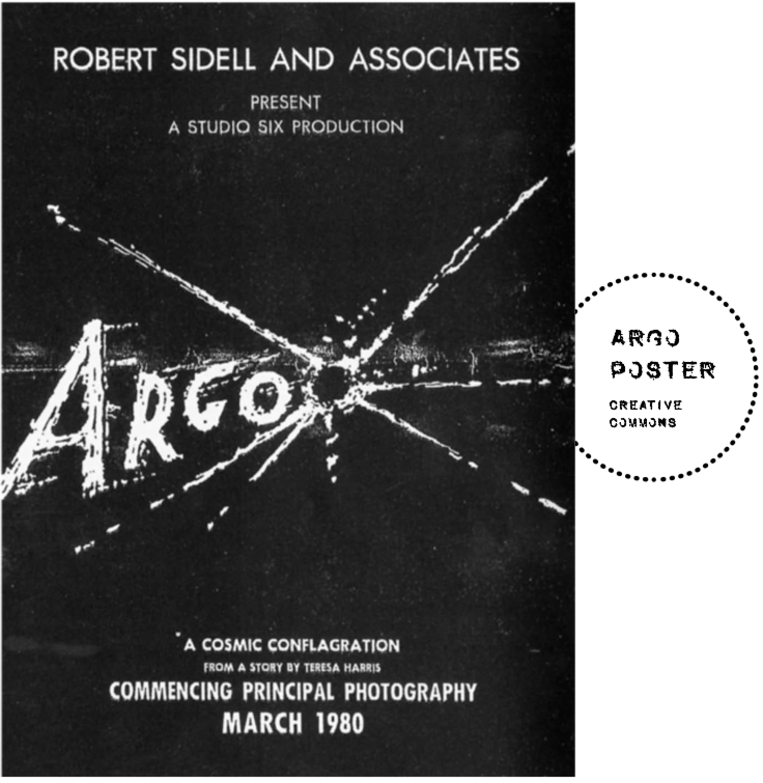 “Their first motion picture being Argo, a science fantasy fiction, from a story by Teresa Harris … Shooting will begin in the south of France, and then move to the Mideast … depending on the political climate.” About the cast, Bob Sidell was quoted as saying, “We will use substantial names. At the moment we are sworn to secrecy.” The coverage in turn generated further interest in this new Hollywood player soon to start filming in the Middle East. Sidell, who had been working in Hollywood for nearly 25 years, always said the whole town ran on BS, but even he was surprised by how easily the fictional universe of Studio Six took on the force of apparent reality. 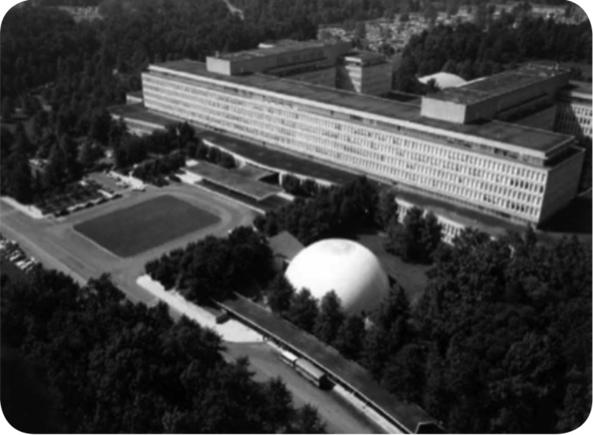 It was not long before this small CIA outpost found itself deep in the movie business. They were always anxious that their secret third line would ring, but every call was film-related. 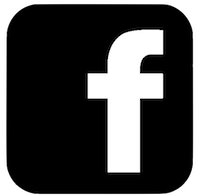 Friends saw Sidell’s name in the ads and started asking for work. “Do you have a crew yet?” they wanted to know. “When’s preproduction?” Within a few weeks, Studio Six was overflowing with head shots, scripts, and pitches from producers. “We’re not shooting for a couple of months yet,” he’d say. 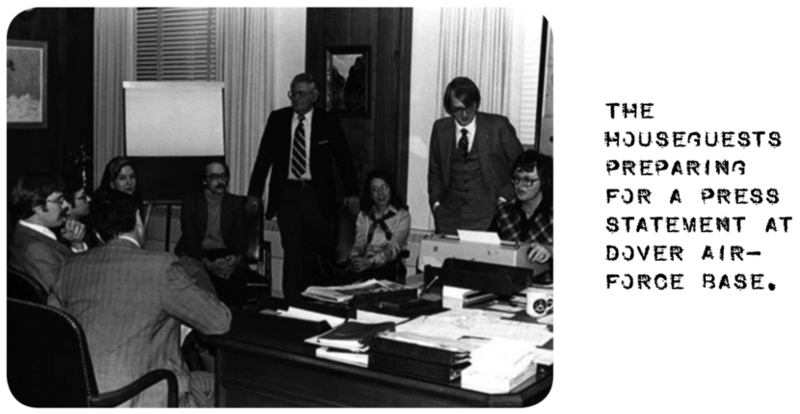 “Let’s talk again in a few weeks.” Several people solicited Studio Six with decent-sounding projects, so Sidell took meetings with them. One writer wanted to adapt a little-known Arthur Conan Doyle horror story about a reanimated mummy; Sidell even pursued releases from the Doyle estate — all the while knowing that, one day soon, Studio Six would disappear without a trace. Everyone was in costume before dawn on January 28, 1980. Cora Lijek had used sponge curlers to give herself a Shirley Temple look. She thumbed through the script as they waited. Kathy Stafford donned heavy, bohemian-looking glasses, pinned up her hair, and carried a sketch pad and folder with Kirby’s concept drawings. Mark Lijek’s dirty-blond beard had been darkened with mascara. Anders thought of their escape as an adventure and flung himself into his role as Argo‘s flamboyant director: He appeared in a shirt two sizes too small, buttoned only halfway up his hairy chest to reveal an improvised silver medallion. He wore sunglasses, combed his hair over his ears, and acted slightly effeminate. Schatz played with his lens. During the previous two days, they’d done several dress rehearsals, with a Farsi-speaking staffer from the Canadian embassy dressing up in fatigues for mock interrogations, probing for cracks in their cover. They’d learned the movie’s story line and their characters’ backgrounds and motivations and were now waiting, essentially, for call time. By 4 am, they’d packed, thanked their hosts, and were on their way to Mehrabad Airport. In the van, Cora checked her pockets again to make sure they contained nothing showing her real name. She and the others started playacting their new roles. The only exception was Joe Stafford, who was ambivalent about leaving behind colleagues at the embassy. He was unenthusiastic about the plan and had refused to change his appearance. Worse, he looked nervous. Mendez had gone ahead. His office had been testing out Mehrabad, sending agents to enter and exit the country, checking the security. But he preferred to see things for himself. Like a bank robber sizing up a heist, Mendez could tell instantly if things felt right. He’d assess the customs and immigration desks — how diligent, for example, was the staff? 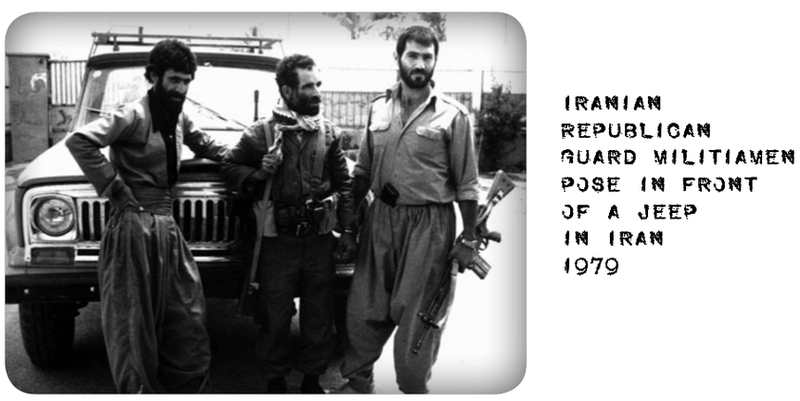 More worrisome than the professionals were the komiteh and Revolutionary Guards standing behind them. Armed and unpredictable, they made the airport truly dangerous. But that morning seemed calm. There were komitehs at customs, but their attention was focused on locals trying to smuggle out rugs or gold. Mendez had picked the early morning because by 10 am, Mehrabad would become a typically anarchic developing-world transit hub, with disordered lines of people, commotion, yelling, and shoving. That’s when the Revolutionary Guard would show up to have their run of the place. 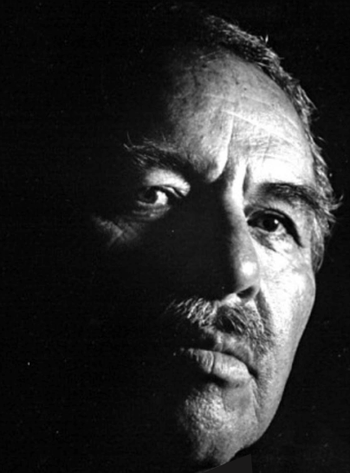 When Mendez saw that the military presence was light, he signaled all-clear to his film crew. The Americans entered the airport with trepidation. They hadn’t been in public, after all, in nearly 80 days. Most of the escapees had worked in the consulate, and they all knew what it was like to scrutinize official paperwork, looking for flaws. Worse yet, three of them had worked in the visa line. 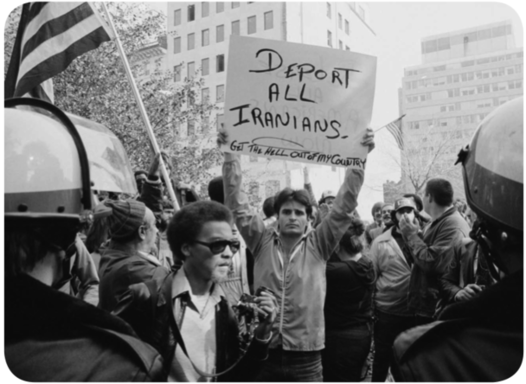 They’d been seen by thousands of Iranians, many of whom might harbor grudges for being turned down. Everyone breathed easier when check-in at the Swissair counter and customs went smoothly. The group made small talk as Schatz approached immigration, presented his passport, and got his stamp. The Americans were momentarily terrified when the officer disappeared with the rest of the crew’s passports. But then he absent-mindedly wandered back to the counter with some tea and waved the group on to the departure lounge without bothering to match the yellow and white forms. The wait was agonizing. Everyone kept their heads down. Joe Stafford picked up a local paper at one point and then remembered that Canadian film crews don’t read Farsi. He also kept using people’s real names, giving the others serious jitters. It was getting later and brighter. The airport was filling with people. They knew there was no backup plan. Mendez wasn’t even carrying a gun, and the Revolutionary Guards were arriving, wandering around in fatigues and harassing passengers. Look them in the eye, Mendez had coached the six in case anyone was questioned. Be confident but seem innocent. But he knew from the agency’s reconnaissance that the guards could be tough, even subjecting people to sudden body cavity searches. A mechanical problem caused a delay, and the Revolutionary Guards were starting to turn their attention to foreign passengers. A few hours later, Studio Six Productions got its first and last call on the secret third line. Startled, Andi picked up the phone. “It’s over,” an unidentified voice said.